Drives like a Car. Flies like a plane. macchina Volantis can provide you with the ability to live where you want to and work where you have too! Drive it out of your garage to the nearest vertical take off point and fly to the nearest vertical landing point to your destination and then drive to your parking spot. 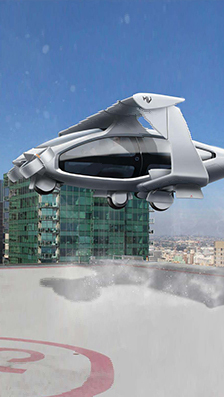 Spacious 4-5 seat (adults) VTOL that will take you door 2 door. 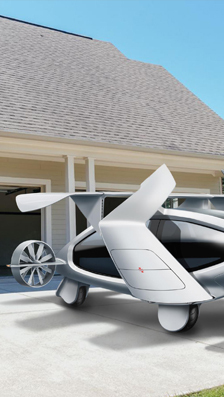 With retractable and folding wings it can drive on the road like a car to get you to your doorstep after flying you most of the way. macchina Volantis will enable urban and inter-urban air mobility. Thereby decongesting our city streets and increasing pedestrian green spaces. Vertical Take Off and Landing (VTOL) capability with auto-hover mode. Built-in triple redundancy on flight control system with ballistic parachute for emergency landing. Detail design to commence shortly. Prototype completed by late 2019. The ultimate personal and family transport vechicle for the future. Designed in Melbourne Australia. Engineered by experienced flight engineers. 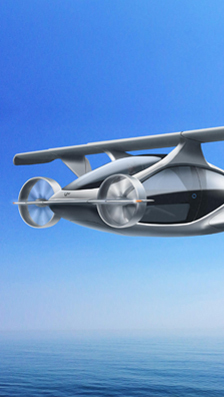 Hybrid electic VTOL road and air transport craft. Take off from almost anywhere and achieve cruising speed within 100 seconds using ducted fans and wing lift. Aerodynamic fuselage designed for style and efficiency. Drive on road with a car licence. Fly with an experimental pilot licence. Cheaper than many small aircrafts. Contact us for pricing. Easy to use drone-like controls with advanced navigation and instrumentation. macchina Volantis is designed with your freedom in mind. Get the maximum range and benefits of our unique hybrid-electric technology. Please register to receive development update emails, further specifications, and early order interest. THE FUTURE IS AS CLOSE AS TOMORROW.